OUR AR-10 .308 PISTOL IS ON EVERY SHOOTER’S WISH LIST FOR THE ACCURACY AND RELIABILITY THAT THIS KIT OFFERS IN EACH AND EVERY COMPONENT. MORIARTI ARMS’ AR-10 PISTOL KIT HAS ALL THE COMPONENTS NECESSARY TO PROVIDE A PERFECT ALIGNMENT TO YOUR AR-10 .308 BUILD. THIS KIT INCLUDES ACCURATE AND TIME TESTED PRECISION BARRELS; COMES COMPLETE WITH 308 MUZZLE BRAKE AND A SLIM KEYMOD FREEFLOAT RAIL. 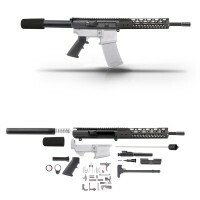 KIT INCLUDES UPPER RECEIVERS, ANODIZED HARD COAT IN BILLET MATERIAL, COMPLETE BOLT CARRIER GROUP WITH A SET OF FIRING PIN, FIRING PIN RETAINER AND CAM PIN, AND MIL SPEC 308 LOWER BUILD KIT. 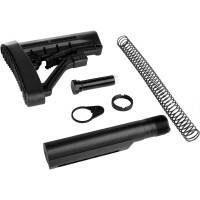 MORIARTI'S AR-10 .308 PISTOL KIT HAS COMPATIBILITY FOR DPMS. 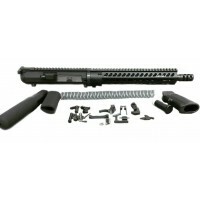 OUR SERVICES ARE AVAILABLE FOR ANY DESIRED MODIFICATION AND UPGRADES OF THIS HIGH QUALITY AR 10 .308 PISTOL KIT.